RELIGIOUS FREEDOM AD CAMPAIGN – Our advertising campaign has several goals, and one of those is to have the Islamic Boko Haram added to the State Department list of Foreign Terrorist Organizations. Once this is done, Muslim sympathizers of the Boko Haram in the United States will no longer be able to legally send money to the terrorist organization. We have seen three years of attacks on religious freedom in the United States by the Obama Administration. At the same time the Obama Administration has supported the Islamist takeover of several nations, including Egypt. Because of Obama’s support of the Islamist takeover of Egypt, the nation of Israel is at even greater risk — with enemies on every border. Add to this the Obama Administration’s refusal to declare the Boko Haram a terrorist organization, despite the fact that this Islamist group kills Christians in Nigeria on almost a daily basis. Hundreds died in attacks on churches at Christmas, and other churches were bombed at Easter, but President Barack Obama refused to issue a statement condemning the attacks by the Islamist Boko Haram. The Congress must act to stop the attacks by the Obama Administration on religious freedom, and during an election year politicians actually listen to voters. That is why our ads exposing President Barack Obama as an enemy of religious freedom are appearing in battleground states such as Florida. I firmly believe that if we expose Barack Obama’s attacks on religious freedom between now and the election in November, there will be a sudden “change of heart” and his Administration will back off. I believe we can force Obama to halt his attacks on religious freedom here at home as well as abroad. We want the rules that restrict military chaplains from telling the truth about homosexuality struck off the books. Christian chaplains are forbidden to pray publicly in the name of Jesus, but Muslim chaplains, who pray only in Arabic, can refer to Mohammed and Allah all they want. Christian chaplains should have the right to pray in the name of Jesus. All of these assaults on the religious freedom of Christians are being exposed in newspaper ads in key election markets at a time when President Obama is seeking reelection. The object of the ads is to get Obama’s attention and to force him to back off his attacks on religious freedom and to stop supporting the takeover of Middle Eastern governments by Islamists such as the Muslim Brotherhood takeover in Egypt. Our first ads are appearing in the key Florida markets of Panama City, Chipley, Bonifay, Madison, Perry, Live Oak, Cross City, St. Augustine and Webster/Bushnell. The ad placements will continue across Florida and move to North Carolina and Virginia next. With your help we can run ads in Pennsylvania and Ohio in the coming months. On January 10th when McFaul was sworn in as Ambassador to Russia, Secretary Clinton said of him, “Few Americans know Russia or know democracy better than Mike McFaul.” Clinton added, “And I can think of no better representative of our values and our interest in a strong, politically vibrant, open, democratic Russia, as well as a deepening U.S.-Russian partnership.” When asked by CNS News, spokesmen for the State Department and the White House refused to define “universal values.” Once again Barack Obama and his Administration make it clear that American values, including the American definition of democracy, are of no interest to them. TAX THE RICH FOR FOOD STAMPS? – Did the Lord direct Caesar to care for the poor, or was it the job of the church? If America chooses Caesar, then the government will replace the functions of the church, and government will become God to many. In 2008, taxpayers spent $38 billion on food stamps. In 2013, that figure will more than double, to $82 billion. Since 2007, the number of Americans on food stamps has skyrocketed 70 percent, to 45 million people–or one out of every seven people living in America. President Barack Obama wants government at the center of the life of every American and this is just one step forward. Meanwhile he wants to dictate church hiring policy and control the message of the church as it administers programs for the poor. The church must take back its traditional and Christ directed role of caring for and taking the Gospel to the poor. BOKO HARAM LETTER TO CLINTON – Steven King (R-NY), the Chairman of the Committee on Homeland Security, and Rep. Patrick Meehan (R-PA), Chairman of the Subcommittee on Counterterrorism and Intelligence, called on Secretary of State Hillary Clinton to designate the Nigerian Islamist group Boko Haram as a Foreign Terrorist Organization (FTO). Their letter to Clinton was based on the bipartisan report entitled, “Boko Haram: Emerging Threat to the U.S. Homeland” and on another related hearing. The report is damning and shows a consistent attempt not only to drive the few remaining Christians from Northern Nigeria with terror, but to place all of Nigeria under Sharia law. Until Secretary of State Hillary Clinton designates the Boko Haram as a terrorist organization, funds may be openly raised in the United States and sent to the Boko Haram to kill Christians. In their letter, King and Meehan reminded Clinton that the Treasury Department could take no actions against transfers of funds to the Boko Haram until she designated it a terrorist organization. One of the goals of the current newspaper advertising campaign by the Religious Freedom Coalition is to force the Obama Administration to designate the Boko Haram as a terrorist organization and stop funding by Islamists in the United States. 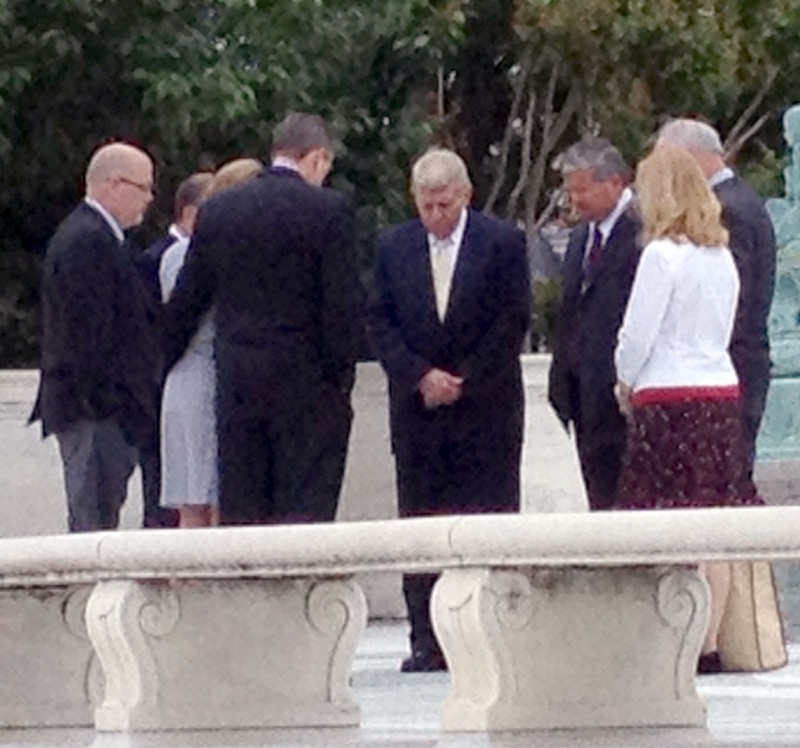 On the National Day of Prayer my morning began with a prayer group on the Supreme Court Plaza. Our group actually had permission to pray, as long as our group did not constitute a “demonstration.” The line between “prayer” and “demonstration” is very ill defined. It is virtually impossible for groups who do not come into regular contact with officials at the Supreme Court to even be allowed to pray publicly. I was joined for prayer at the Supreme Court courtyard by several activists on Capitol Hill including Peggy Nienaber of Faith and Action and Rev. Patrick Mahoney. After praying for the nation we had the opportunity to have breakfast at the Supreme Court cafeteria where we joined together before eating to say grace, which is a prayer not often said in that building! At this year’s prayer meeting Congressman Forbes shared miraculous events which occurred in his life as a result of prayer, including the survival of his first child despite doctors telling him that he and his wife needed to say their goodbyes to their newborn son. The overall chairman of the National Day of Prayer event in Washington each year is Shirley Dobson, the wife of Dr. James Dobson, founder of Focus on the Family. The military and every branch of government was represented — except for the Obama Administration. President Obama did not send a representative. One of the highlights of the day was the Azusa Pacific University all men’s choir, which sang several traditional hymns a cappella. After the National Day of Prayer meeting which lasted from 9:00 AM to noon, I attended a special lunch with Congressman Louie Gohmert of Texas for the International Israel Allies Caucus. Congressman Gohmert spoke of his most recent trip to Israel and his meeting with Prime Minister Netanyahu. (Note: It was Congressman Gohmert who initiated the recommendation that led to Speaker Boehner inviting Prime Minister Netanyahu to speak to a joint session of Congress in 2010.) The congressman spoke of the continued need for prayer, but also reminded us that while Israel is mentioned as being part of End Time prophecy, the United States is not. He said nations that do not stand with Israel should not expect God to protect them. At 2:00 PM on the National Day of Prayer, I made my way to a meeting at the Capitol Visitors’ Center (CVC) which sits below the actual Capitol Building grounds. While most people believe this is merely a tourist entrance since the shooting at Tom Delay’s office some years ago, it is actually an official business entrance as well. Also unknown to tourists is the fact that the CVC has both House and Senate meeting rooms that can be reserved only by Members of Congress for their use or the use of their constituents for special events. Full catering service is available. JORDAN – The Religious Freedom Coalition continues to send medical supplies from Amman, Jordan to Christians in need in and around Damascus. The support of Al-Qaeda associated “rebels” by the United States and the European Union is making it increasingly difficult for Christians in cities such as Homs, and they are taking what belongings they have and moving to Christian strongholds to the north in Aleppo, or to Damascus in the south. In recent weeks the fighting has subsided and we have been able to move additional supplies into Syria. This month key personnel from the Jordan ministry operation will visit the United States and it is my prayer that we will be able to send additional supplies of bulk antibiotics and other high-value materials back with them by air. Please continue to be in prayer for the safety of the workers in Jordan as they travel to Syria.